Slowly, but surely there is progress in the kitchen. The steps to the right of that cabinet towards the dining area still need to be done. The flooring store ordered the wrong kind of step noses (flush instead of over-the-top). They were also from the wrong manufacturer, so even if I had wanted flush step noses, I would not have been able to install them. Before I could install the floor I tore out all the previous layers of flooring: Water-damaged laminate, pseudo-tile linoleum mat, grey linoleum tiles. All three (!) layers either stuck together real good, or came off easily, creating a mishmash of varying floor height. I had no choice than to scrape everything off all the way down to the sub-floor. A crowbar was quite handy for the parts that were glued to the subfloor really good. 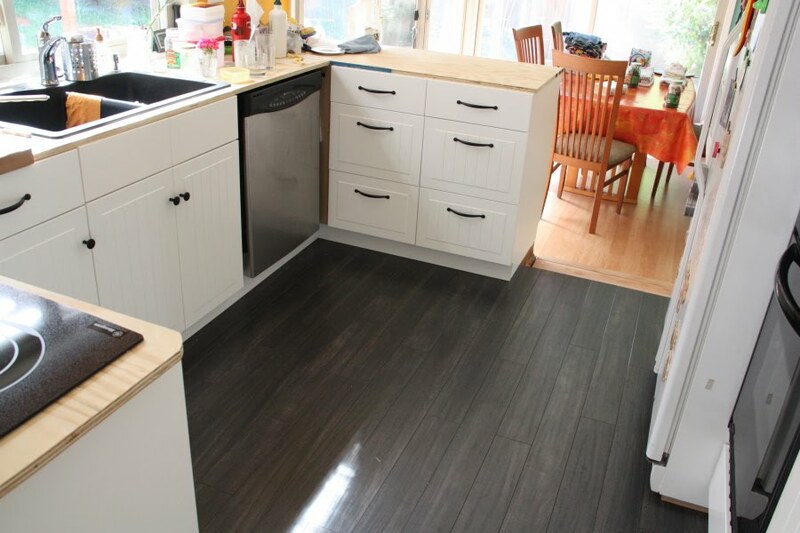 Installing laminate flooring is quite easy, since the tongue and groove system snaps together with a little pushing. Even though this floor doesn't need to be glued, I sealed the joints with silicone caulk in the area near the dish washer and sink. The fridge is very heavy and causes compression of the acoustic pad under the floor, and therefore some warping in the floor near the fridge. I'll probably replace that really thick padding with some lighter padding with vapor barrier I have left over from the dining room flooring project plus thin plywood to get back to the same height. For now I placed boards under fridge to distribute the weight a little bit better. The other big recent project was the range hood. We bought an IKEA Nutid HDN P650 range hood (yes, another IKEA purchase). This unit is not nearly as ugly a the typical range hood, and also doesn't get in the way of my head standing at the cooktop... (hah, as if I ever cook a lot). The new hood has a damper, the old one didn't. A damper has one-way doors inside the pipe, so that the exhaust air can be vented outside, but no outside air can come in. Several visits to OSH and Lowe's later I had all the parts I needed. Initially, I planned to mimmic what the old hood did: Get a 8 inch to 6 inch reducer, mount it on the damper and run the existing 6 inch pipe into the ceiling vent duct. Admittedly, that's a shady proposition. Next idea: use a flexible duct and connect that instead of the pipe. Still not great, since in order to make even that work, I still need to mount the hood 2 inches off-center. Also, when test-fitting parts I noticed that the damper doors don't open if the reducer is set right on top of the damper. No, I want to do do this right. 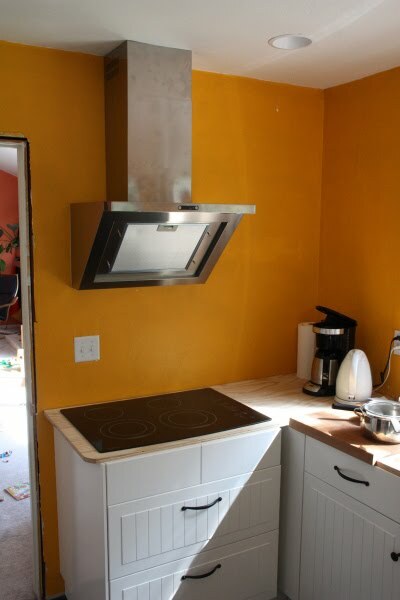 The range hood needs to be centered above the cook top. Everything else looks bad. Which means the vent has to move to the left. First I enlarged the ceiling hole for the vent pipe(even the ceiling is just drywall after all), so that I can move the pipe close to the center line. I wondered how that pipe actually stays in place, since nothing seemed to be holding it up, until I discovered a small nail nailed into the wall framing from inside the pipe. I pulled it out and ... almost the whole pipe slid out of the ceiling. Oooops. While I had the pipe out of the way (and Patricia held it, since I couldn't get it out completely) I installed the bracket for the vent hood cover (that square tupe extending up to the ceiling). Next I pushed the pipe back in realizing that it's actually just held in place by the fitting of the roof top vent and one nail. Since that nail was out already I could easily move the pipe an inch to the left. Oh, by the way, the installation instructions of the P650 are terrible. There are two places where they indicate that the hood should be 30-36 inches above the cooktop. Unfortunately, in the one paragraph they say "the canopy", and few pages later they say "the bottom of the unit". Not helpful. I mounted the top of the unit (which I guess equals "canopy") at 32 inches. It also comes with no less than 6 different kinds of screws. Some of them of fairly similar in size, so it's easy to confuse them. The instructions also say that all 6 installation screws are "to be mounted in wood". This is an american kitchen with drywall on wall studs, and I don't have the luxury to move the hood along the wall so that the screws all go into a stud (which they wouldn't anyways, since they are not spaced right). 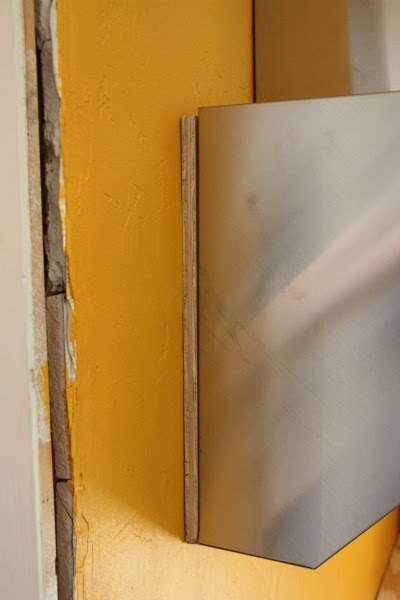 I decided heavy duty drywall anchors are sufficient, and on top of that I'll drill some additional holes into the back of the range hood housing so I can sink a couple screws straight into a wall stud. The system for hanging the hood in theory is quite cool. There are 2 wall hangers that have adjustment screws for leveling the hood. Once the unit is level, 4 additional screws securely connect the hood with the wall. Unfortunately, the drywall area were the right hanger would go was apparently damaged and badly patched up by a previous owner. This was the first time it happened to me that a plastic drywall anchor would just keep turning as you drive it into the wall. In the end I cut a sheet of 1/2 inch plywood and mounted it on the wall with screws going into the one wall stud in that area, and mounted the hood on top of that. 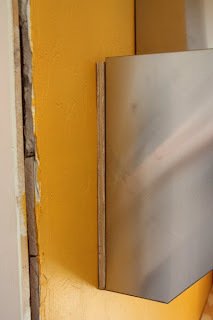 The screws are long enough to reach through the plywood into the good drywall anchors, so this should be quite solid. Now I just have to come up with a way to hide the plywood. Because the range hood is 1/2 inch away from the wall, the cover for the venting pipe doesn't quite fit properly either. I'll have to think some more about how to work-around that, or maybe I'll just leave it. Hooking up the electrical wiring was a piece of cake in comparison to mounting the range hood. After all I'm quite pleased with how this came out so far. Also, the P650 operates very quietly. Even the highest setting seems to be quieter than the old range hood. Thank you for the posting of the photo & description of IKEA's Nutid range hood. I've bought it a while ago, but never installed, and now misplaced the manual. At least now I can print your description to help my handy man to mount it.